Hostmonster offers almost 20 years of reliability and service to thousands of companies around the globe. Priding themselves on customer service and support, providing top quality hosting services at affordable prices, they offer flexible hosting solutions for everything from small personal websites to medium sized businesses. The Hostmonster guarantee assures customers they can rely on the use of quality equipment, maximum guaranteed uptime, highly functional administration tools, with secure backups. They also promise to use solid and honest business practices, so that you can too. The Hostmonster Starter plan is a great choice for newcomers to the online world. It allows you 1 website, with 100GB of space, unlimited bandwidth with 1 domain and 5 parked domains, and up to 25 sub domains included too. 100 email accounts are included with capacity for 500MB per account, and you will also be given $50 of marketing credits to use. The most popular option is the Plus account. Unlimited websites, space, bandwidth and parked and sub domains, as well as unlimited email accounts and storage. $200 of marketing credits, a global CDN and 1 SpamExperts for spam prevention makes this an excellent option for small businesses or larger personal websites. Business Pro includes all of the above, with double the spam protection, an SSL certificate, a dedicated IP address and SiteBackup Pro. You will also be given privacy protection over your domain, and be ensured the highest level performance for your website. Search Engine Submission is also supported by Hostmonster, which makes your website stand out from the crowd in the search rankings, a huge plus for any hosting company. 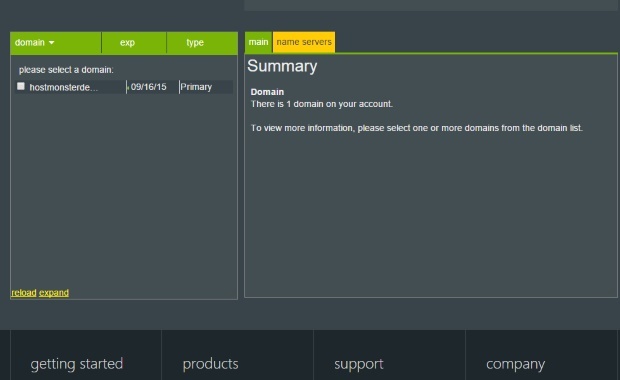 HostMonster offers customers a cPanel control panel. Known for its flexibility and security, cPanel has also become an industry-wide standard. Today, cPanel is considered to be one of the best solutions available for customers that need full control over their site and their accounts. cPanel offers you a variety of easy-to-use wizards that help simplify setting up new pages or even a shopping cart. It also gives you control over things like email, your account, your domain, and other advanced functions. If you are looking for more control, you might consider one of the VPS options available. These offer root access with an enhanced control panel, multi account management with one login, instant provisioning to get up and running in seconds, and guaranteed server resources thanks to Hostmonsters KVM hypervisor virtualization. All the VPS solutions are built on cloud technology to offer a guaranteed growth plan for your business. Choose from Single Core to Quad Core, with RAM from 2GB to 8GB and Bandwidth up to 4TB per month for best performance. Ecommerce features supported by Hostmonster include an SSL secure server for safe transactions, various options in shopping cart including OS Commerce and Zen, a free generation security certificate for your website, and password protected directories so that your customers can shop without fear. Hostmonster upholds the standard industry 99.9% uptime guarantee and backs it up with dual quad processor performance servers and UPS power backups, as well as diesel generator backup power. They also have a customized Apache web server and 24/7 network monitoring, and offer courtesy backups to all customers. You can always be assured of the best performance with Hostmonster’s multiple 10 Gigabit Ethernet connections. Hosting support is so important, as your website success depends on being able to get the answers you need when something goes wrong, no matter what time of day. 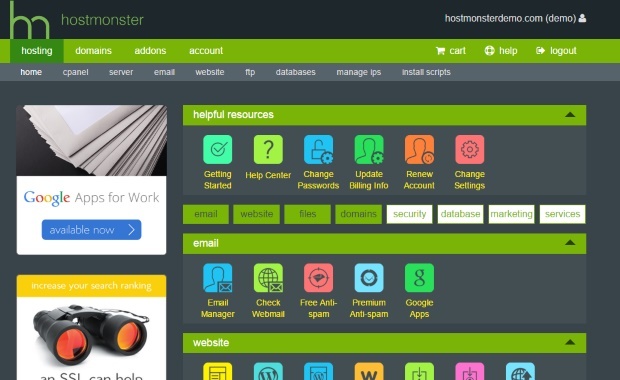 The help center at Hostmonster is extensive, and includes a helpdesk and ticket enquiry system, your own personal support history, a vast knowledgebase full of helpful articles and tutorials, and a video tutorial section as well as a user forum to get answers from other customers. You can also receive direct 24/7 help from the knowledgeable and friendly staff members via telephone or even live chat. You can’t ask for more than that! Hostmonster is a great choice of web host, regardless of whether you are a beginner creating your first personal website, or a medium business looking for growth. With excellent additional features such as SEO and ecommerce functionality, as well as unlimited bandwidth and the highest levels of security included as standard, it’s easy to spot their two decades of experience among the crowd.